Holy Smokes! I was eating lunch yesterday in downtown Pleasanton, California. A very nice warm day, we were eating outside when I pointed furiously at the road. 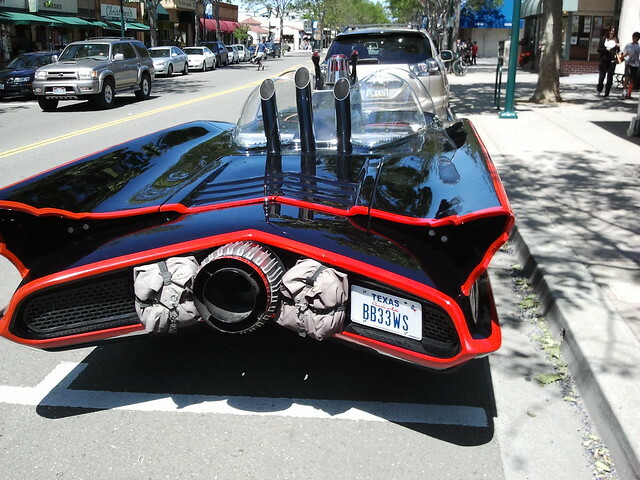 I saw 2 people driving the Batmobile down toward the main street. I was so excited my wife thought I had seen an accident. It went by so quickly I wished I had my camera out. Fortunately, when we walked down the street later, there it was! My wife took this picture for me. Pretty good, eh? She got the Pleasanton sign in there too. It really looks like the Batmobile that Adam West and Burt Ward drove. The black hull gleams in the sunlight as you c an see. Even the tires have the bat symbol. The rear of the car is outfitted for turbines to speed. Powered by Atomic Batteries, no doubt! 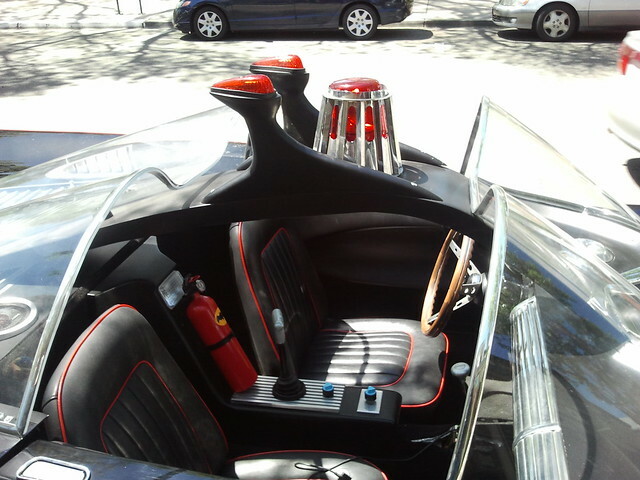 The interior cockpit has the crazy bat-light on top and a Bat fire extinguisher as well. 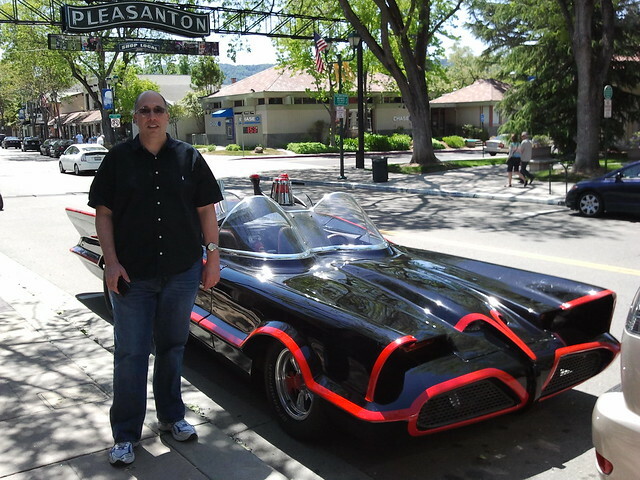 According to this article in the Pleasanton Weekly, this Batmobile is owned by Anthony J. Bettencourt, the CEO of a software company called Coverity. 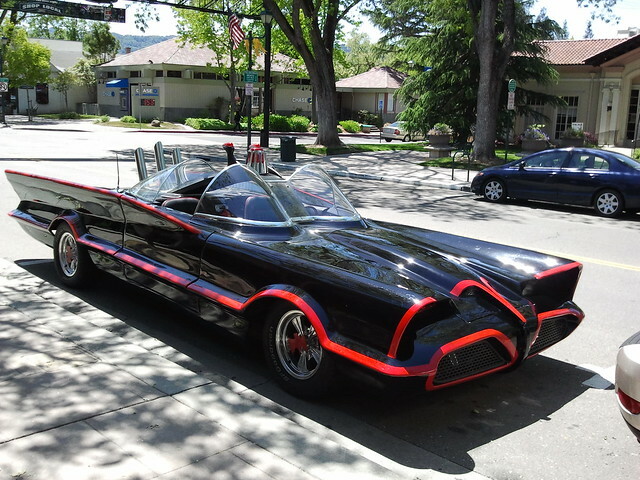 Even more interesting—the Batmobile will be parked outside the Heroes and Villains comics store in downtown Pleasanton for Free Comic Book Day on May 7th. That is a very nice store, I recommend everyone in the area to pay them a visit. Nuff Said!